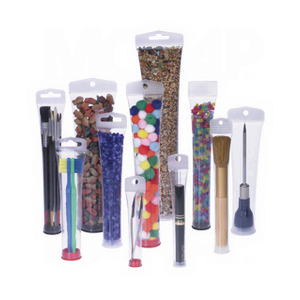 Our clear plastic hanging tubes are the solution to your retail display problems. Our flat sealed hanging tubes create compelling displays, allowing the customer complete view while keeping the product protected. Easy to insert and remove, our inner-fit poly plugs are the suggested closures for our clear plastic hanging tubes. They are stocked in red, black & natural colors. Our hanging tubes are ready for your retail packaging challenge. A novel, built-in hanger allows your product to hang on a peg hook, while requiring only one closure. Attractive and durable, these hanging tubes are available in a total of eleven diameters, manufactured to your specified length, with either a round or sombrero punch. To help maintain lower retail packaging costs, our hanging tubes are produced with an ultra-thin wall, which are slightly thinner than our standard thin wall plastic tubes. These plastic tubes are also available with a flat seal only or a die cut flat seal without hole-punch for countertop displays or other non-hanging applications. In addition to our plastic hanging tubes, Cleartec Packaging also offers ultra-thin wall tubes and containers, thin wall tube packaging, heavy wall tubes, sealed bottom containers and mailing tubes.